The new mid-range smartphone features a triple-lens rear camera configuration akin to Huawei's flagship. It combines a 24-megapixel (f/1.7) lens with AF, an 8-megapixel ultra-wide lens (f/2,4) and a 5-megapixel (f/2.2) depth lens. No indication yet as to whether the sum of these parts will allow for the 3x and 5x zoom functionality available on the P20 Pro. However, the Galaxy A7 will support the same Scene Optimiser and Live Focus features found in the Galaxy Note 9. If nothing else, the move sets Samsung up to make a big comeback in the smartphone photography arena with next year's Galaxy S10 and Note 10. 2018 has seen the Korean giant lose ground to both Google and Chinese rivals like Huawei. The Galaxy A7 also boasts a 6.0-inch Super AMOLED Infinity Display and Dolby Atmos speakers. Under the hood, it's equipped with a octa-core 2.2GHz processor, 3,300mAh battery and either 4GB or 6GB of RAM depending on the region. It'll also come with Samsung's voice assistant Bixby on-board. Samsung say the Galaxy A7 will be available in select European and Asian markets from this fall and expand to additional markets in the near future. No word yet on Australian pricing and availability. 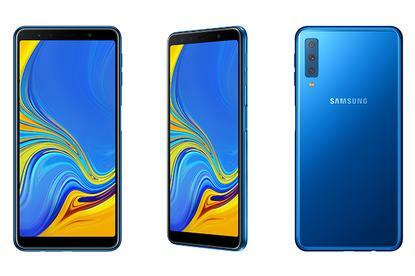 If it does arrive, the Galaxy A7 will be available in four colors - blue, black, gold and pink. Samsung also took the time to tease their October 11 event, which the company say "will welcome a new member to the Galaxy family."